That was then and this is now..... The Association has traversed a long path since 1981 and has in the meanwhile gained official recognition by the Institute. It has a full fledged itenary of annual activities and a bank account of its own. The Alumni Association is headed by the President and the Director of the Institute holds this chair. A faculty is nominated as the Adviser to the Association. At present, Prof. S.G. Mishra has been nominated for this post of the association. The executive body is elected in a General Body Meeting held on the Annual Day, each year. The Secretary, Asst. Secretary and the Treasurer are elected in this meeting for a period of two years. 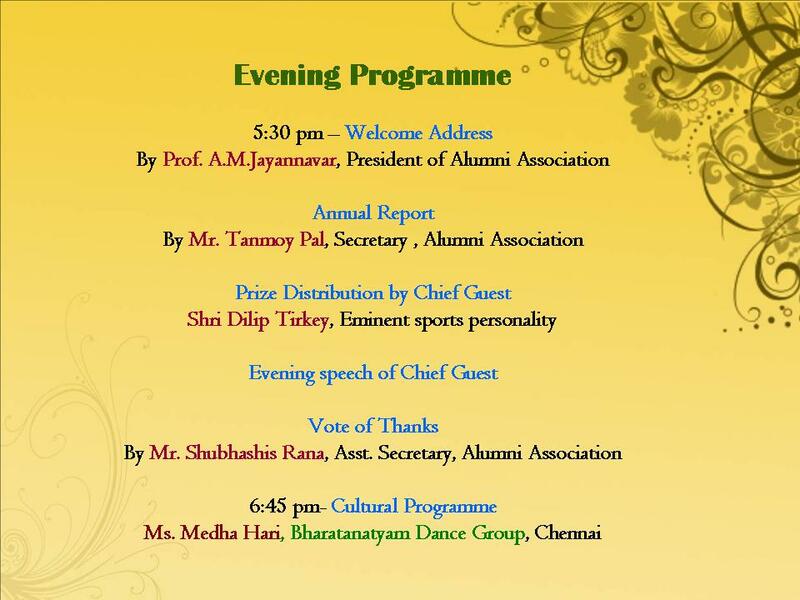 The Annual Day of the Alumni Association is held each year on the 3rd of September. Though the attendance of the alumni is not satisfactory, quite a few of them do make it a point to be present during the meeting. At the General Body Meeting the alumni are given a chance to express their views and interact with the rest of the members. Eminent personalities from various fields of life are invited as the chief guest to deliver talks. The Association has been succesful in organising various competitions among the school and college students as a part of its annual activity. The first such endeavour in this direction was made in the year 1993, when the then office bearer organised a Quiz competition amongst the children within the campus. It was very well received and there was keen competition amongst the participants which enthused the organizers to hold a Debate competition at the college level the next year. This has with time grown into a prestigious competition in which some of the best debators of the state participate to display their oratory skill. The association plans to conduct Science shows, exhibitions and competitions so as to popularize science among the general masses. Though it is a small organisation, it is striving in own little way to carve a niche for itself and serve mankind by popularising science amongst the future generation. It is our ferverent hope that everyone involved - the Director, the faculty, scholars, administrative staff and all the Alumni of the Institute will join hands in keeping this Association alive and vibrant. The Alumni Association organizes State level English debate competition among the college students, i.e. students of +2 and bachelor's degree. The debate competition is held in two rounds, the preliminary round being held at the zonal levels. This competition has been widely recognized as one of the prestigious debate competitions of the state. The zonal level competition is held simultaneously at the same time, same day and on the same topic in six different zones of the state; the zones being Berhampur, Sambalpur, Bhawanipatna, Baleswar, Kendrapara and Bhubaneswar. The Alumni of the Institute posted at various colleges throughout the state, extend their helping hand in organizing the zonal level competition. The Finals take place at the Institute of Physics. The first three winner of this competition are awarded prize money. Apart from this a Science Modeling Competition is also hosted by the Association. Students from more than 15 schools throughout Bhubaneswar, participate in this competition. About 150 students, demonstrate a variety of models, ranging from "Save Environment" to small experiments on light and electricity. The response of the school students comes beyond our expectation and the eagerness and interest shown by both their teachers and parents is very heartening. We also arrange a Science Quiz Contest for students of +2 and bachelor's degree students in and around Bhubaneswar. On the occasion of the Silver jubilee year of the Institute, the Association released a Souvenir. Other than the messages from the President, Former Directors and the Advisor it has a contributory article section and the bio-data of almost all the alumni of the Institute. Eminent film director Sri Mrinal Sen released the Souvenir on Alumni Annual Day.